The City of Mesa and surrounding area may experience several road closures on Saturday, February 9th, as runners in the Phoenix-Mesa Marathon make their way through the city. While there are many roads closed, the best way to avoid the race completely is to use the local freeways versus side streets. The route will begin at Usery Pass, south on Ellsworth to McDowell, head west to Ridgecrest and will go through the Las Sendas neighborhood to Power. Then, it will go through Red Mountain Ranch to Recker, south to McDowell, and west to Val Vista. The race will go south to Brown and then west into the downtown area. 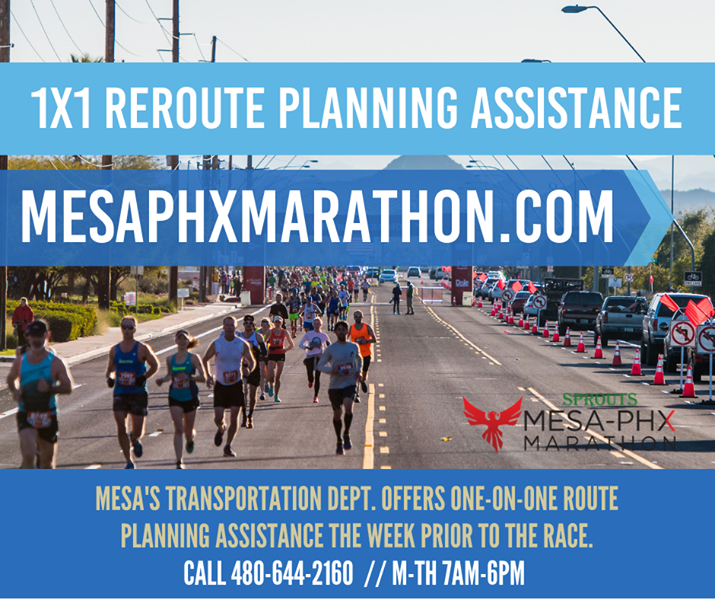 Whether you are participating in the festivities or looking for alternate routes visit the mesaphxmarathon.com website or call the Transportation department at 480-644-2160.